Every last one of the Western River guides went out of their way to make this Colorado River Adventure fun and enjoyable. On most trips you remember one event. 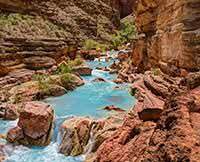 On this whitewater rafting trip around every corner there was a new spectacular view of the Grand Canyon walls. Just when you thought you had seen it all the Colorado River would turn and around the bend was another scenic view in a different light that was just fantastic. Someday I will be back!! !